Alex Mensaert is originally from Belgium and a triple amputee. He wrote different books and lived in different countries, even the Favela of Rio de Janeiro, where he lived for a long time belongs to his favorites. When you don’t like your own country; in this and my case for many reasons, -Then it is always nice to think about living in other countries. So many people don’t like their own country, and when it comes to Belgium and my reasons for it? So many racist, people who tell that they aren’t against colored people, but once it comes to reality, they even dare to tell you: ‘What the hell are you doing with a black girlfriend?!’. Near that: So expensive, so many arrogant people, and as I told to many people during my many world travels and the many countries I lived in: ‘If the neighbor gonna buy a new car, then the other neighbor will buy a new car too, just a little bit more expensive. Not that he need a new car, but just to show that he can afford it’. Thinking about it is one thing, doing it is another thing. I’m talking about living in other countries. I lived in Brazil, Rio de Janeiro (and a few other cities); Sri Lanka, near the capital of Colombo, USA, Fort Lauderdale, near Miami (state of Florida) and now in Portugal, in the city of Lisbon. 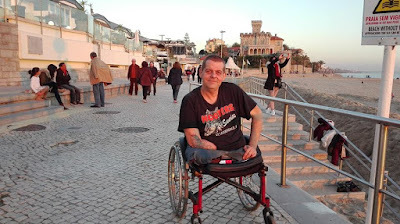 As an amputee (being legless and one arm), it is something more difficult to organize living in another country, because Belgium don’t give the permission to live in whatever country you want. A crazy law from the insurances who pay the money to people with a disability, and they make so many problems around this. In my case, I have permission to live in Brazil, USA, Europe, the North of Africa (Magreb countries) and even the Philippines, but to live in countries as Kenya, Uganda, Zimbabwe, Mozambique and some others I wouldn’t mind to live, they don’t give any permission. If you live without legs and one arm, then for sure you can use some help at home. If you need to pay a maid over here in Portugal, it would cost you for sure around $1000 each month. That’s for the most people with a disability income of around $1200 to $1400, not to do. If there would exist a permission, to live in whatever country you want to, then you could live in a ‘poor’, let me call it ‘more normal’ country. Even in the middle of Africa. Where for sure you still would have money over to live from, even after paying a maid. Finally someone more over there would have a job, and even the costs for disability help would be much lower. While no one helps you in the streets, when you life in cold Belgium, for sure there are people in the middle of Africa (and other countries), who comes to help you, with a big smile on your face, without the hope that you gonna pay them something. That I have even seen in Brazil. But maybe, they get one day a little bit smarter, to give at least the permission to the people with a disability, to let them live wherever they want and they prefer. When you are retired from Belgium out, then it isn’t any problem anymore to live wherever you want, in the country you want. That’s really a very silly law. What’s the difference about being younger and not retired yet. Do we need to wait till n older are before we really can live in the countries we want? Or will they open their governmental eyes once? But there are already changes; Brazil wasn’t on the permission list, till 2014. Then it changed. I even remembered that when I wanted to live in the USA, I first needed to go there, only could change my address after 3 months, by insurance law in Belgium and then I needed to fly especially back to Belgium, only to see their doctor from the insurance for about 10 full minutes, to finally get the permission to live in the USA. A really retarded trip it was, that we needed to make for this. Now, by requesting information for Brazil and the Philippines recently, they answered me very clear on email that I even didn’t needed to go there anymore to their agency of the CM at Ostend in Belgium, that I just need to let them know by email, when I would love to live in one of those mentioned countries, and that it all will be immediately arranged. A fantastic evolution, let’s hope and pray that other countries on their list of permissions will be submitted soon. Being disabled is one limitation, but their limitation of possibilities and the short list of countries they only allow to live in, is another ‘disability’. Now, you always can decide to live in another country, without their permission, but then also the monthly disability help stops. Again, this is a real bad thing, since Europe is a Union, and knowing that there are even a lot of European countries, who do give the permission to live in whatever country you want too, when it comes to this subject of Disability. My dream for many years was to live in an Africa, surrounded with poor children and babies, to help them, as I did when I lived in Brazil, but when there is no permission for that, then you only can forget that dream. A triple amputee from Belgium, Europe, but living very far from it. More about Alex Mensaert: Alex Mensaert was born on July 1, 1970 at Tienen, better known as the sugar city of Belgium. Alex is a father of 2 children and was four times married. He lived for many years in Tienen, but decided to put a little step in the world and to live outside of his birth area. He lived in different cities all over Belgium. Alex likes to travell a lot, he lived in different countries like Brazil, Sri Lanka and at least in the United States of America, where he lives in Florida, near Miami. Already from a young age Alex started to get interested in the world of writers; This came because his grand aunt Julia Tulkens and his uncle Jan were also active in the world of writers. In 2004, the first book from Alex came out. ´Forbidden Love´(book in Dutch), about his life and what his second wife had done to him. After that he published a book for children: ´Rice pudding with golden spoons’. Alex signed his book on the book fair of Antwerp (Belgium). He is also the writer of 'Amputation on Request', a book about people who are attracted to amputees and people who want to become an amputee.